As tenants in both San Francisco and Oakland reel under the highest rents in the nation, new development and investment is causing tremendous market pressures destabilizing everything from housing to health to political power. With the rent crisis reaching new heights in the Bay Area, a group of local activists are physically blocking the entrance of the East Bay Rental Housing Association’s “Economic and Legislative Forum”, held at Scott’s Restaurant in Jack London Square. Dozens of community members, dressed in hazmat suits, carrying banners and blocking doorways, have declared the gathering “Toxic for community health,” says Robbie Clark of Causa Justa. The East Bay Rental Housing Association had planned an Economic and Legislative Forum for discussing legislation that favors landlords and reduces protections for tenants. Key speakers include Daniel Bornstein, a notorious landlord attorney who specializes in evictions. Organizers of the protest decided to expose the conference, because these types of gatherings usually fly under the radar of the general public, even as the public is increasingly voicing their opposition to gentrification and for tenant protections. The tech boom is sending Bay Area rents to record highs and in-your-face activism has skyrocketed. 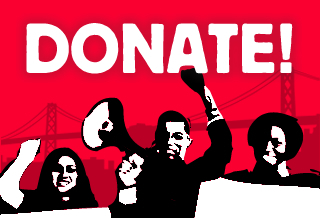 Local community organizations like Causa Justa :: Just Cause, Housing Rights Committee (HRC), San Francisco Tenants Union (SFTU), Tenants Together, Asian Pacific Environmental Network (APEN), and others are coordinating and escalating their response. A report, released yesterday, shows how evictions have increased dramatically in San Francisco in recent years. That same trend appears true in Oakland. Just Cause, one of the organizations leading today’s protest, has also been organizing efforts for tenants rights regionally, and posted this article recently, about the need to step up organizing and activism. Please contact us for copies of Development without Displacement: Resisting Gentrification in the Bay Area.